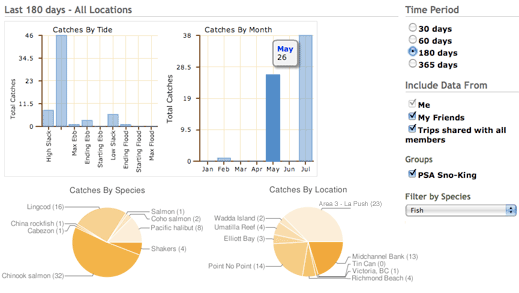 Log and Analyze your (and your friends') fishing data to catch more fish! Sign up, it's free and everyone can join. Already a member? Login to view your trips. 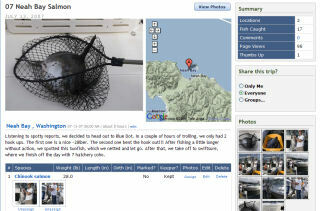 We've created the ultimate free online fishing log by fishermen, for fishermen. It is designed so anyone can create a great looking fishing log quickly and easily. Use our fishing maps to give the vicinity of where you fished or pinpoint your exact fishing locations. Add optional information such as catch info, lures, current, tide, moon phase, water temperature, barometric pressure, etc, so that you can analyze catch information by those parameters. Remember, the more optional information you add, the more powerful the analysis of your fishing log will be. We'll also be able to provide personal stats such as personal bests, hours fished, landed/lost ratio, success rates, etc from your fishing log on your profile page to show off your skills! Concerned about privacy? Fishing logs are kept completely private until you change the privacy settings. Most people don't fish enough for their fishing log to generate good analysis data, so we've designed the analyzer to be able to include shared fishing log data as well as your own. You can include fishing log data shared by your friends with you, to your club, and publicly shared data. Imagine the power if your group of friends fish at different times on the same location that week, and immediately you have the fishing log data to see what affects your catch rates! So invite your friends and start sharing with each other. A picture's worth a thousand words! Complete the fishing log by easily adding photos and to prove that you caught the big one! Photos are automatically created and thumbnailed for the best presentation and download speed. The originals are also kept in case you need to retrieve them.